Beryl E. Organ, born in Bristol in 1928, has been devoted to animals and flowers all her life. For many years she ran a modelling agency. In later life she took up writing and over the years she has produced a series of children’s books, all focusing on the natural world – some in prose, some in verse. An accomplished artist, she paints pictures of animals, birds and flowers, from pet dogs and cats to wild birds and butterflies, and accompanies them with short poems and stories. 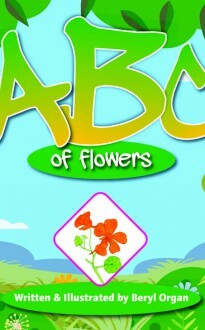 ABC of Flowers is aimed at 5 – 6 year olds who are just beginning to read and will find encouragement to explore nature and the world of words. ABC of Flowers, Mrs Organ’s sixth children’s book and is a light-hearted look at some of the delightful flowers to be found in gardens, meadows and woodland. With her son Colin, a professional photographer, she has also compiled Reflections, a collection of verses accompanying delightful photographs of rural and garden scenes. All her books are dedicated to her great grandchildren.